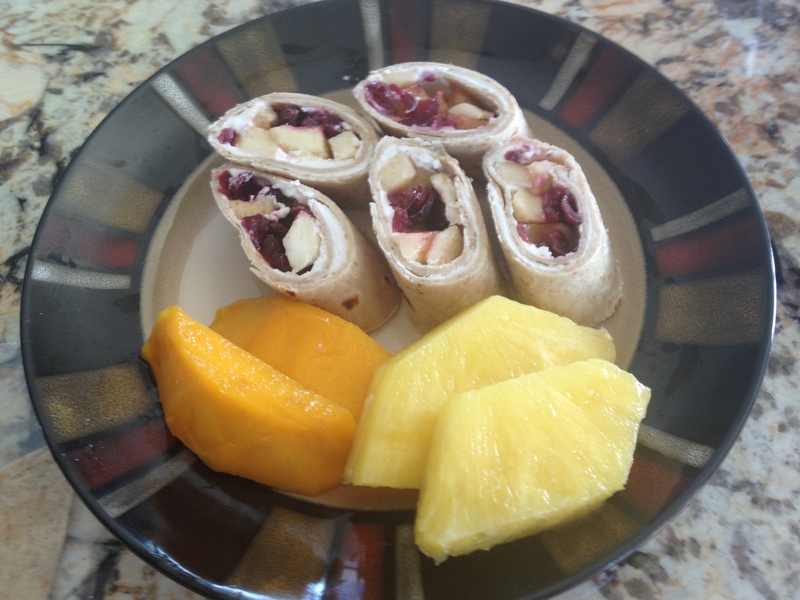 If you are looking for a healthy snack to replace the sugary cookies and candy bars your kids crave, whip up these wraps in the morning so they are ready for them after school. Serve with pineapple or orange segments for that extra Vitamin C boost that will help with homework stress! 1/2 cup unsweetened dried cranberries or substitute your favorite dehydrated fruit, diced. In a small bowl, mix together softened goat cheese with yogurt and honey until smooth. In another dish, combine shredded apple with lemon juice and cinnamon. Add dried cranberries and mix. Spread 1/3 of goat cheese mixture over an entire tortilla shell. Place 1/3 of apple mixture on half of tortilla shell and then roll. Ensure the edge of shell has goat cheese mixture to seal the end. Repeat with 2 more tortilla shells. Wrap rolled shells in plastic wrap and refrigerate for a least 1 hour. Cut each tortilla shell in 1 1/2 inch pieces and serve. You can also cut tortilla shells in half and serve as snack portions.